stored inside in perfect condition until sold. Without question, the Bristol Channel Cutter, built by Sam L. Morse Company, in Costa Mesa CA is one of the most appealing vessels on the face of the earth (ocean) today. This phenomenon is easily explained. The vessel is natural, it is human-sized. It is a realization of our imagination and our deepest yearnings to sail. It is a way to have great and wonderful adventures. The people who own these vessels do have great and wonderful adventures! Hull 123 is special, actually super special! She was named Americano by her first owner. He was a tall man and had her built with a slightly higher cabin house and a lowered cabin sole. As a result, hull num 123 is spacious and roomy and light and she accommodates the tallest of sailors. The headroom is a verifiable 6'9" in the main salon. The berth is 6'6" as opposed to the normal 6’. 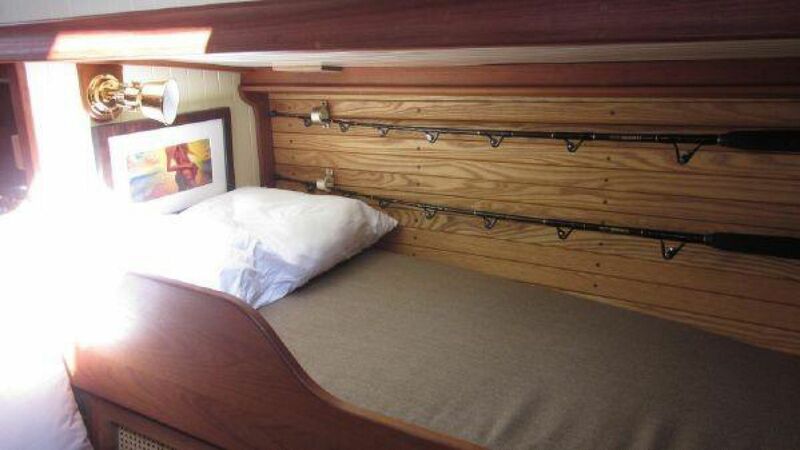 The small adjustments add up to big space on a small boat. Okay tall sailors…no more excuses! Her current owner has enjoyed her for just about ten years. He has continued to invest rather lavishly in adding all the imaginable things that make this BCC equal to any 40 foot boat you could own. 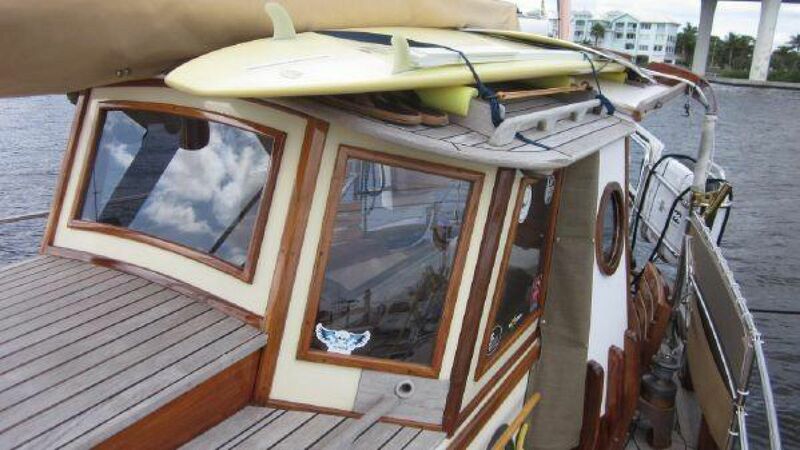 She has a custom hard dodger and bimini that can even carry surfboards on top. He had new teak decks glued on! 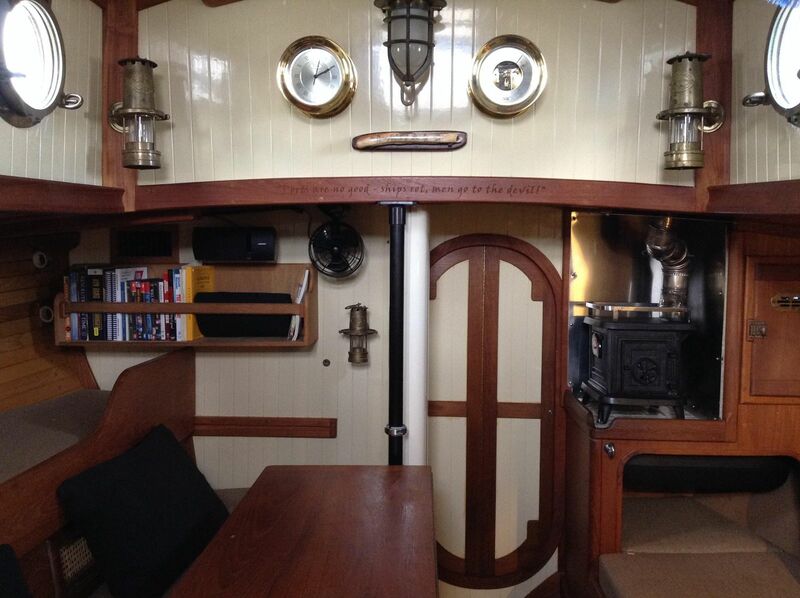 Tall interior with 6’6” berth and 6’9” headroom! New Schattauer Ultimate Offshore Sails including the mains’l, hank on stays’l and hank on yankee headsail! 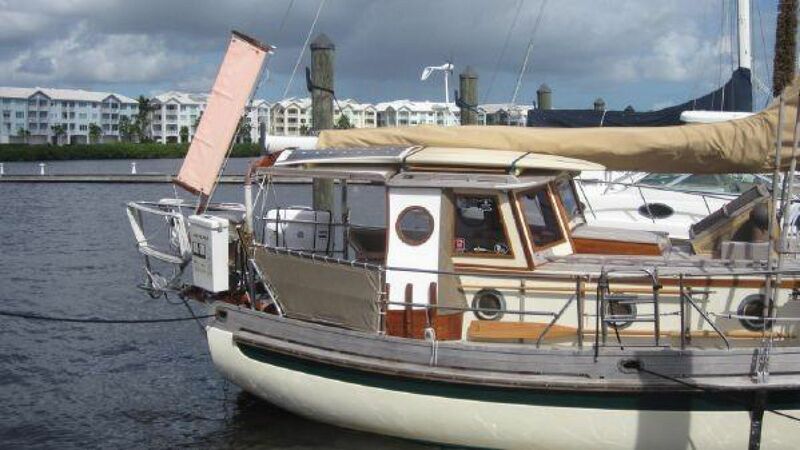 This Bristol Channel Cutter reminds us of the special one owned by Roger Olsen that he built for himself as the ultimate cruising vessel with a hard dodger and custom interior to convert the settees to a giant double berth and everything possible aboard! Rogue is the closest BCC you will ever find to Roger Olsen own BCC. Over the years people have called asking where they can get the Tall One. There are only two that were built for tall people and they come available once in a lifetime. 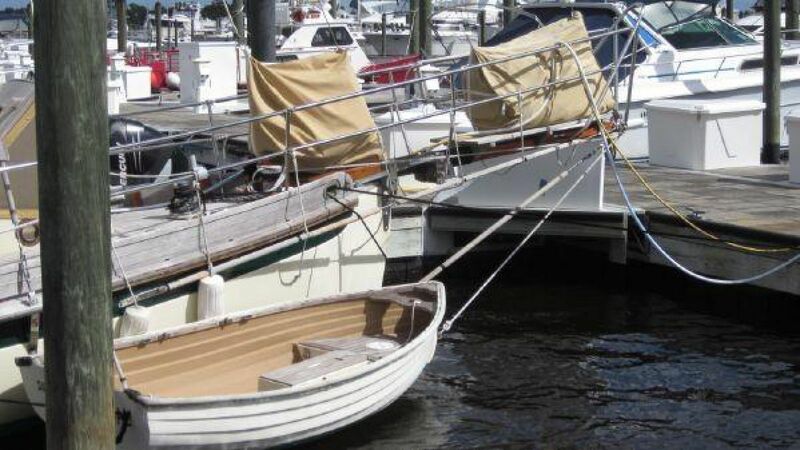 If you are tall and always wanted a Bristol Channel Cutter, this is your chance to own one. We already told you Rogue is seriously special. The BCC interior is as perfect of a creation as you will ever find on a 28 foot boat and Rogue is even more amazing with the ability to convert the two straight settees to an amazing king sized berth! Having sailed our own BCCs far, we know just about everything there is to know about the space. We sure know it works. And with Rogue every bit of space is organized and used to the max. The basic layout is the Sam L. Morse factory layout which is totally proven. 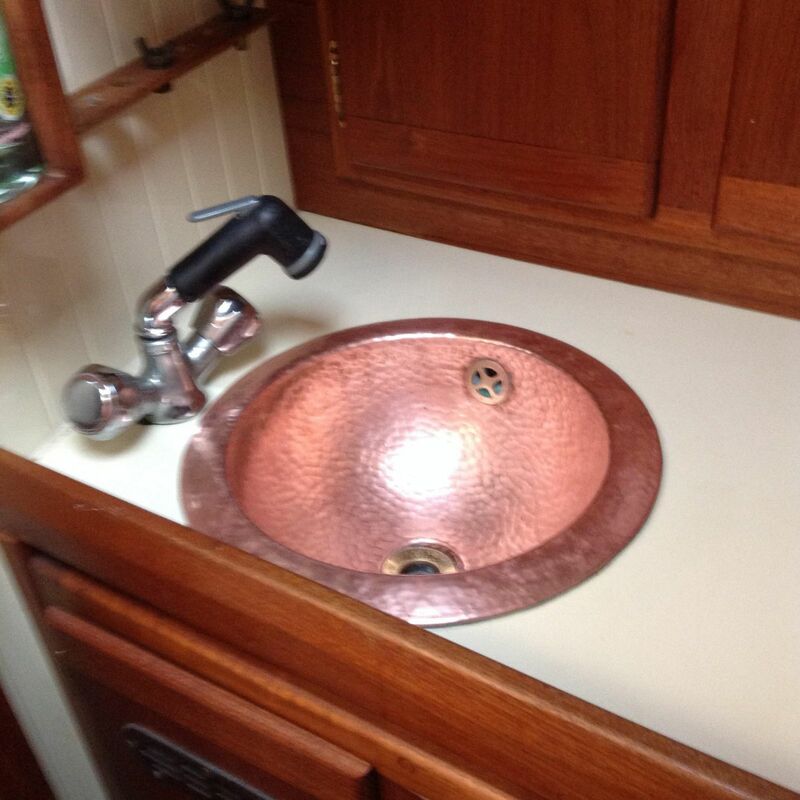 When you enter the companionway, the galley to port is near perfect with incredible storage and amazing work space. I love the galley and it offers more than many much larger boats. The salon is perfect. The ambiance is lovely with teak wood and bronze. The settees are just a tad wider on Rogue which makes her even more comfortable. The famous slide out double bed is also wider and a whole six inches longer! The table slides away to make a great open spacious salon which of course can be converted to a king sized berth! The storage lockers under the settees and outboard are completely finished inside and latching lids. The cabinetry is finished with dividers and everything is designed based on input from BCC owners of the 122 vessels built before Rogue. The forward cabin is completely finished as no other BCC! There is even a larger opening into the forepeak area which is also completely organized. The list of comforts and accommodations goes on and on. The layout, the design, the finish, the forethought. The lighting, the heat, refrigeration, the organized lockers! The BCC galley is to port, right when you walk down the companionway stairs. It is incredibly well designed and totally workable. The Force Ten propane stove is a three-burner stove with and oven and broiler of course. The storage on a BCC rivals that of any forty foot boat. There are cabinets are outboard, a huge dry storage locker to the left of the stove and another to the right. The counter space is also amazing! 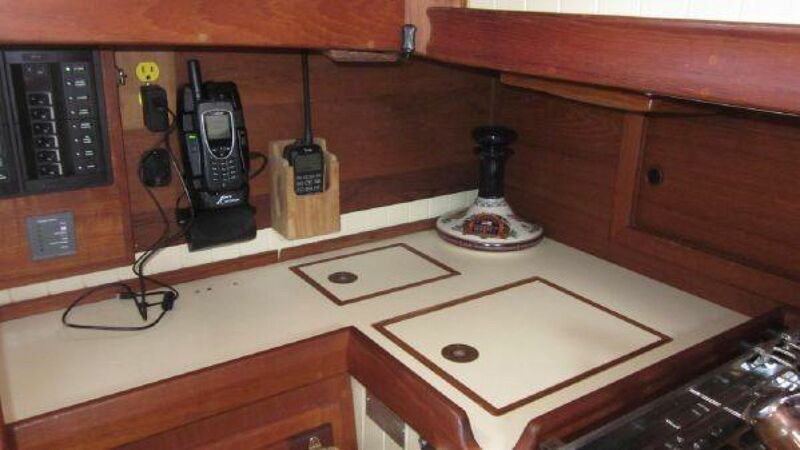 There is counter space galore and it is even better on Rogue because there is extra counter space along the bulkhead. 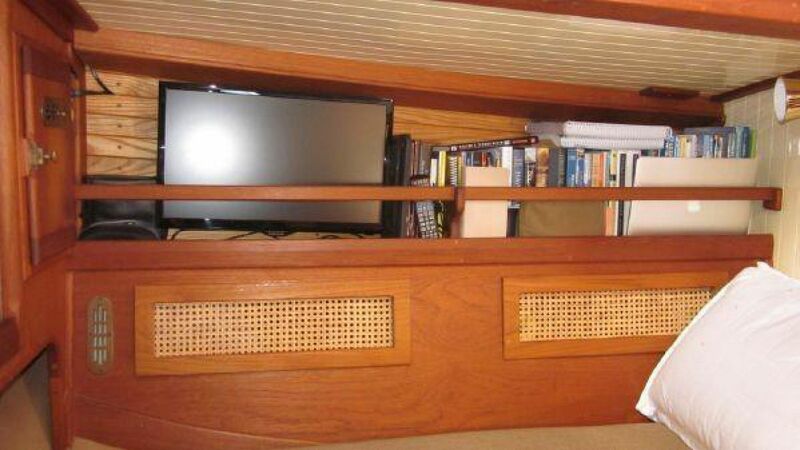 There is the full hinged top of a large refrigerator which is on starboard and creates the stand-up nav station. 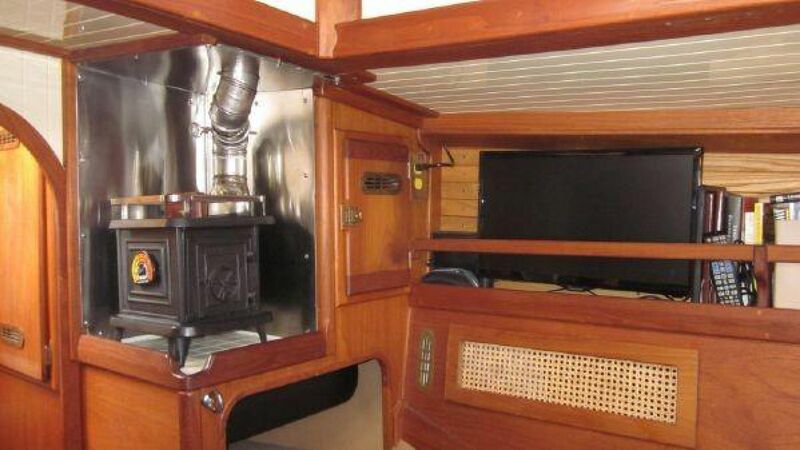 The famous hinged counter connects to the port side to make the galley extend across the boat! Rogue’s galley is very well equipped with 12volt refrigeration installed in a very well insulated icebox. Hot and cold pressure water and propane make the galley a great kitchen! Lavac toilet is under attractive seat bench so you never have to sit in the salon and star at it. The BCC has a tidy stand up Nav station over the refrigerator to starboard with all the equipment a proper offshore voyaging vessel should have. The sailing and navigation instruments are all professionally installed by the factory with instruments are in easy view of the cockpit. 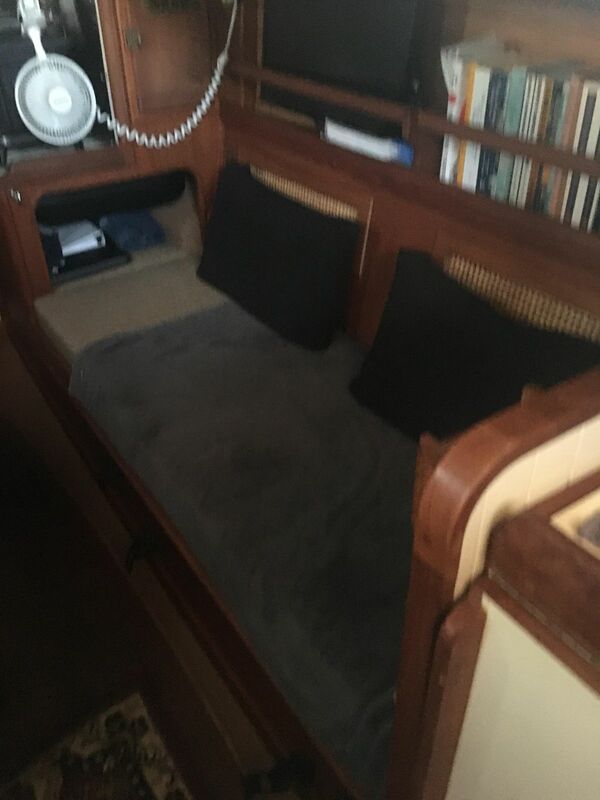 There is a large chart table, and flush mounted equipment panel, as well as the famous BCC chart locker above the Quarter berth. There is also good shelving for books and equipment manuals. The BCC systems are very simple and easy to maintain. There is nothing overwhelming about the boat. Rogue is special in that her systems have been carefully planned based on input from many BCC owners and sailors. The Sam L. Morse Company sought to make Rogue the perfect example. They certainly made great choices from the engine room with its installations to the large battery bank, solar panels, and wind generator with LED and energy efficient Alpenglow lights. On top of everything else, this Sam L. Morse BCC was built as the show piece for the company and the perfect example of the modern BCC cruising boat. She is an awesome example of a modern Bristol Channel Cutter. Charged with Balmar AT-DF 165 amp output alternator! Despite her modest length on deck and 14000-lb displacement, the BCC surprisingly fast with her true cutter rig and bow sprit providing a tight sheeting angle. While the theoretical hull speed 6.9 knots, we've surfed along at over 7 knots often. You can plan on 135 mile days, and reports of 150 mile days are not infrequent. 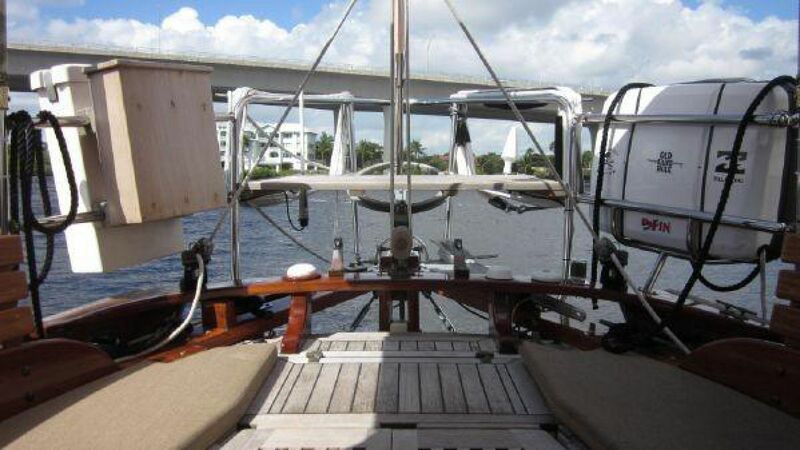 She has the water line (26’3”) and the sail area (750 sq ft) to keep up with much larger boats! And maybe even more importantly, she gets a safety factor of 10 on a scale of 1-10 and she'll always be comfortable well behaved in rough weather. Rogue’s rig is the standard BCC overbuilt rig with a few extra improvements, of course. The Forespar double spreader mast and boom are black anodized aluminum and then painted ivory to match the hull gelcoat. 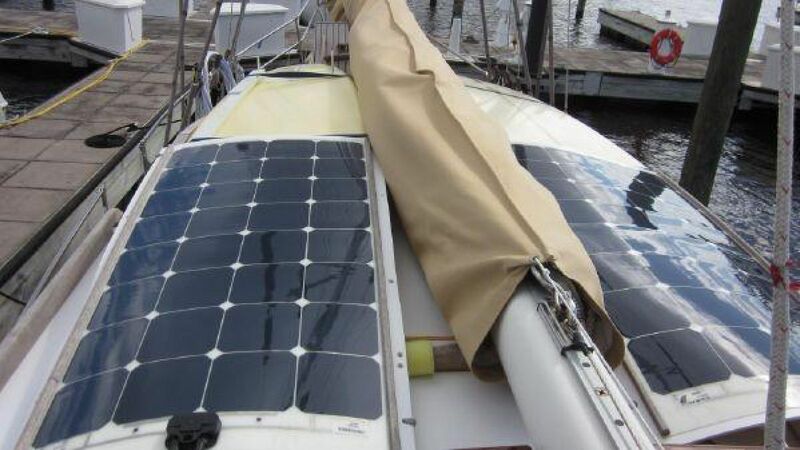 Every thought was given to ease of sailing when rigging the boat. The mast is keel stepped and the rigging is upsized. The new sails where built by Schattauer Sails Inc. in Port Townsend renowned for tradition offshore sails. The staysail is hanked on the removable inner forestay with the ABI quick release. Staysail inner forestay with quick release Lever 9/32"
Tiller is beautiful laminated piece of art, new! The BCC is a traditional full keel, true cutter, with the prettiest underbody I've ever seen. Her displacement weight is 14,000 lbs. 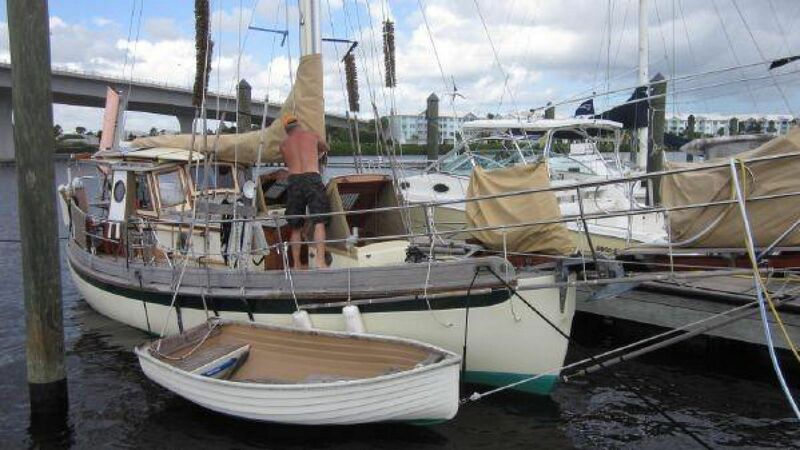 She’s 28 feet on deck, she is about 38 overall with her bowsprit and boomkin. You cannot compare the BCC to other 28 footers with her long waterline of 26’3’ gained from her plumb bow and straight transom. The BCC is surprisingly fast, especially off the wind. While her theoretical hull speed is an impressive 6.9 knots, we have seen 7+ knots many, many times. We plan on 125 mile days and those 150 mile days do happen. HULL: The hull is hand laid using multiple layers of fiberglass cloth and resin. 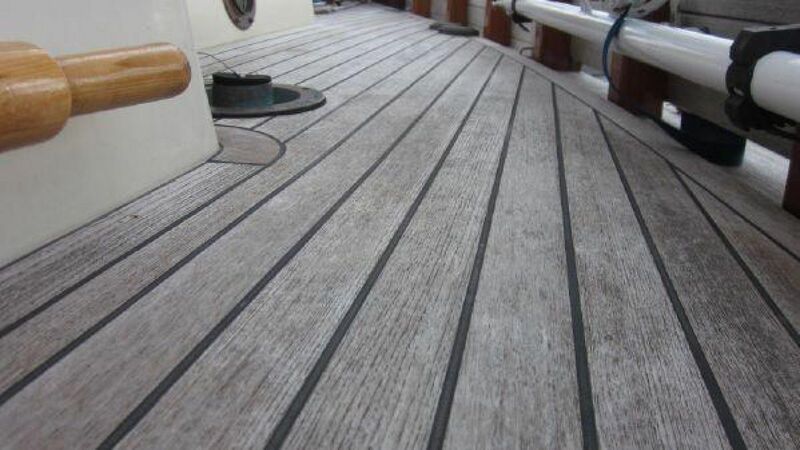 Thickness varies from nearly an inch on centerline to about 3/8-inch at the deck edge. The deck and cabin structure are a sandwich construction utilizing marine grade plywood rather than balsa core. The hull and deck are joined on an inward flange, bolted on six-inch centers and sealed with 3M 5200 adhesive sealant. There are no prefabricated liners used so the entire interior built into the boat like fine furniture and tabbed to the bulkheads and hull sides to strength the entire structure. The construction makes the BCC a very, very strong and well-built boat. There are 126 of these cruising the globe and some are more than 30 years old. RUDDER: The rudder is a massive external rudder that makes the boat track well and steer with the wind vane and heave to. The rudder on Rogue is the new improved Sam L. Morse rudder with solid glass construction in all the areas where hardware is attached. The trim tab attached to the rudder for the Freehand wind vane steering system is also used for the tiller pilot and allows it to steer very easily. It also can be adjusted to offset the prop wash while motoring or motor sailing. 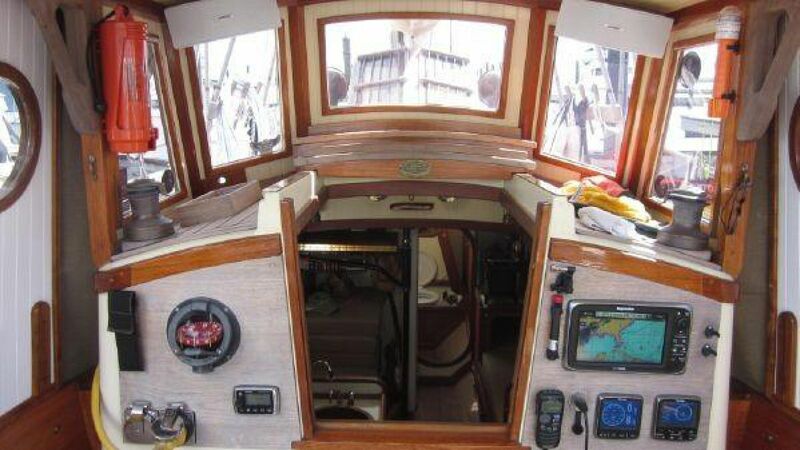 DECK: The BCC has parallel cabin sides, the side decks are astoundingly broad-2.5 feet in one spot, which with the very high 8 inch bulwarks, make for comfortable and safe cradle for working on deck or hanging out. The bulwarks are beautiful, constructed by solid planks slightly raised off the deck, supported by massive teak posts on 20 inch centers. 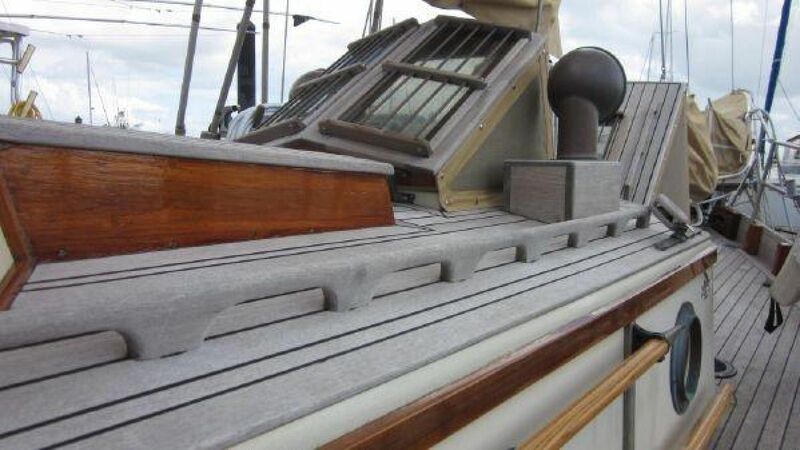 This means the entire deck is a scupper, ensuring quick drainage in any sea. The entire top of the little forward doghouse opens, making passing sails, an easy job. The cockpit is comfortable, safe and with good combings around, making for a good back rest. 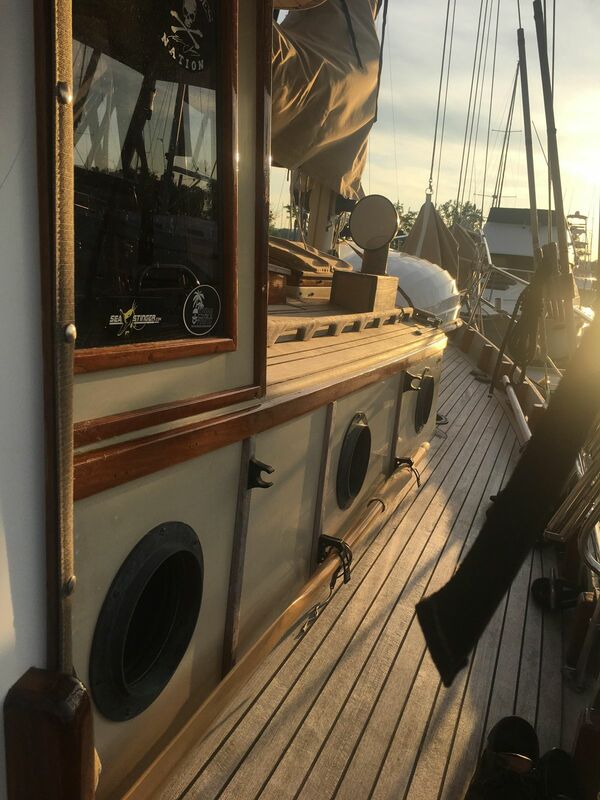 Glasswork is done by the same folks that built all the Westsail, Crystaliner, who have over 25 years of experience in building world cruising fiberglass sailing vessels. The results are beautiful. Massive sampson posts support the mooring lines and make her a little ship. The Fatty Knees dingy is designed by Lyle Hess and it is a perfect complement to the whole package as it stows neat, clean and secure and out of the way under the boom. Observations as told by Sam Morse, describing his philosophy about his boats which he builds: When my wife Betty and I got into this back in 1975, we wanted to build a really good boat, not the super hyped incredible and awesome quality of so many boats being advertised, but something much more than that. The true quality of a really honest boat-the best you could build. Like the one or two things you have owned for so long you have forgotten, things that still work, still do the job, just as they were meant to. Like the little CO2 soda maker weve had for years, made in Sweden, that still works as well as ever although it needs a new gasket now and then. Just a good honest piece which someone made to really last and give someone his moneys worth-nothing ever broken, nothing ever fallen off, still looks good on the bar. Its a simple device and thats important. We want our boats to be like that. This BCC is a yacht of a timeless successful classic, a design that will look graceful till our oceans dry up. Surprise will grace any harbor, and when at anchor, while rowing away from her, will keep your eyes glued to her beauty, as she swings on her mooring, and under sail, shes stiff, strong and fast. The international sailing community knows the BCC, if the Pardeys Seraffyn, to the pilot workboats that brought the big ships safely to port in the rough waters off England. These boats soul purpose was to go to sea and come home safely. There are no finer seaboats ever built, PERIOD. The Bristol Channel Cutter is the most beautiful sailing vessel ever built, It melts my heart when I see one, keeping my eyes glued to her, till shes out of sight. Bring food and your belongings and leave tomorrow for anywhere in the world. Thats a very reassuring feeling about your vessel, your home and your love. She represents one of the best values for a true offshore sailing/liveaboard that is currently available. 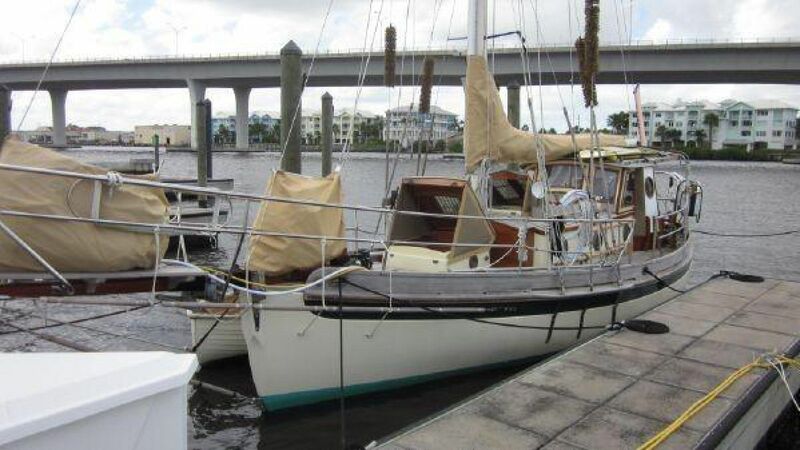 Please give me call, I love talking boats, especially about boats like this lovely BCC, she's fun to show, and even better to own. Reviews GOOD OLD BOAT magazine: May/June 1999; "In the wake of the Pardeys"; by John Vigor. The Bristol Channel Cutter (BCC) is a boat of superlatives. For many dedicated long-distance cruisers, she is, for her size, simply the best of everything: the most comfortable, the most seaworthy, the most traditional, and (naturally) the most expensive. There are some who call the BCC the Rolls Royce of yachts, but they have it the wrong way around. The Rolls Royce is actually the BCC of automobiles......The BCC as designed by the legendary Lyle Hess and built today by the meticulous Sam L. Morse company, is as cultured a piece of sailing machinery as youre likely to find anywhere. In fact, you wouldnt be far wrong if you said that Chippendale and Hepplewhite were the BCCs of fine furniture......"
BLUE WATER SAILING: June 1998; "Lyle Hesss Bristol Channel Cutter"; A detailed review of the design and performance of the Bristol Channel Cutter and a Cover photo. "The Lyle Hess-designed, Sam L. Morse-built Bristol Channel Cutter (BCC) has been around for nearly a quarter century, crossing oceans and knocking off 150-mile days in the trades, riding out storms with aplomb, and carrying it crews safely and happily to countless backwaters of the world...." CRUISING WORLD magazine: December 1996; REVIEWS, "Bristol Channel Cutter 28"; by Barbara Marrett. A review of the Bristol Channel Cutter. "I've been impressed by consistent reports of the good blue-water performance by owners of these venerable craft... If you want to cruise in a proven conservative design, in a boat that has and will withstand the tests of time, the Bristol Channel Cutter demands your careful attention." SAILING magazine: January 1996; "CLASSIC CUTTER, The Bristol Channel Cutter is 28 feet of ocean going charm"; by John Kretschmer. A review and sailing boat test by sailing magazine. "Designer Lyle Hess is the Bristol Channel Cutter guru. He is responsible for blending the seakindly and unexpected swift, full keeled hull shape of the Bristol Channel Cutter with more modern construction techniques and rigging... My initial reaction upon climbing over the lifelines was that this was not a 28 foot boat... the Bristol Channel Cutter is, by all accounts, a big 28 footer... We shot off on a close reach and our little photo boat struggled to keep up... We beat our way south, close tacking through both commercial and pleasure traffic...I was amazed at how easily she came through the wind, trimmed up and accelerated. She certainly did not feel like a heavy full-keeled cruising boat... Surprise was clipping along at seven knots." PRACTICAL SAILOR September 1995; Volume 21, Number 17 and 18; "Three Semi-Custom Cruisers". A critique on a Alerion Sloop, Bristol Channel Cutter and Morris 40. 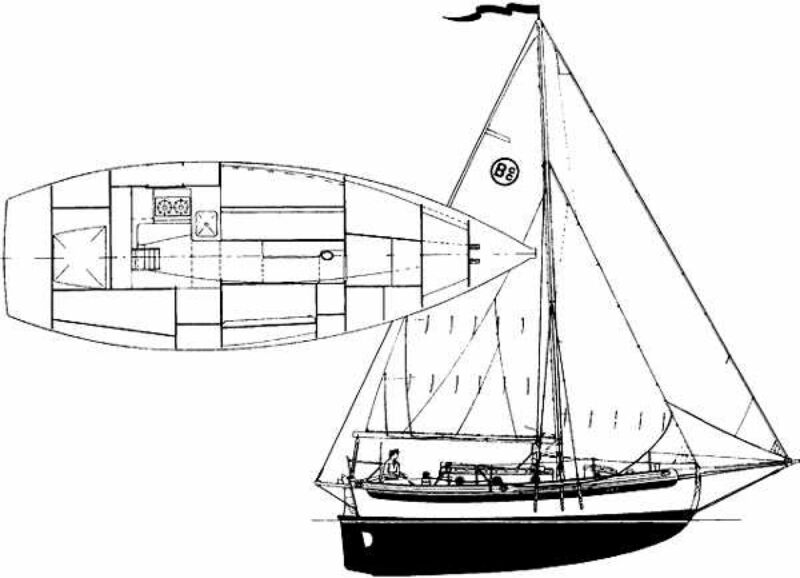 "The BCC, inspired by British work boats, is a heavy displacement cruising boat with a long waterline, short overhangs, full keel and big rudder. The cockpit, while quite small(it holds just 700 lb. of water) is quite comfortable, with generous backrests... This is a go anywhere boat, which like the Alerion, is a piece of furniture that you hope your children will cherish when you pass on." The BOATMAN (A British magazine) October 1993; "The Bristol Channel Cutter" by Randall Brink. The author gives his opinion of the Bristol Channel Cutter. "The BCC is rich in character-sufficiently so to satisfy the most stalwart of traditionalist-yet, despite its traditional line and its look of a very purposeful boat, it is fast-remarkably so for a beamy, heavy-displacement cruising hull. The BCC's performance history includes many days of 180 nautical mile passage in the logs of its owners due, mainly to the generous sail area and long waterline length. The boats have also marked a number of race victories: first overall in the Newport-Ensenada race in 1978 (out of some 400 boats), first in its class in the Newport Ensenada race 1979 and first overall in the 1980 Panama Canal Yacht Club race. Most recently, in 1990 won the overall season's "A " class trophy for outstanding performance in Bougainville, Papua New Guinea... While underway the BCC will sail 30 degrees to the apparent wind at hull speed. It performs very well under windvane, hands-off. This is a boat that you can comfortably leave alone on long passages. 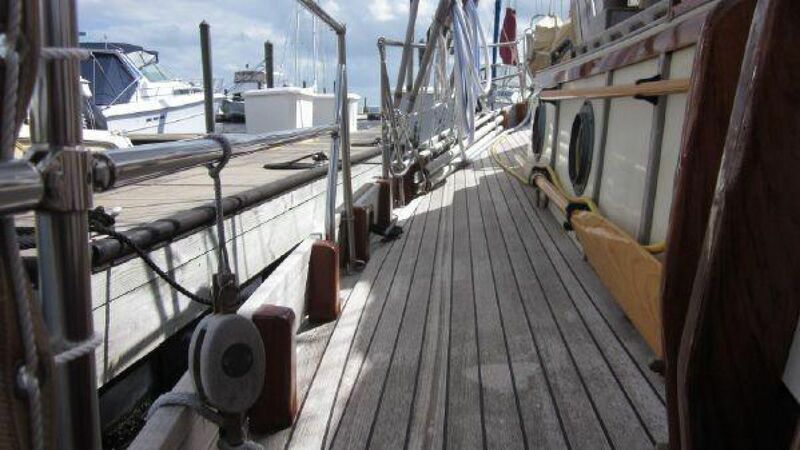 Some owners have reported twenty days or more during a passage when they have barely touched the tiller." BEST BOATS TO BUILD OR BUY: A book by Ferenc Mate. "One For the Eyes, Bristol Channel Cutter". Also the cover photo. A personal review of the Bristol Channel Cutter. "Exaltations aside, the boat is strong, stiff, beamy and heavy, and considering its wetted surface, fast. To put it simply, it's really a 34 foot boat without the overhangs... Below decks the boat is a wonder. In spite of the narrow deck house there is much volume, and Mr. Hess' original layout is one of the most sensible I've seen for an off shore cruising boat designed for two people... The Bristol Channel Cutter is built like the proverbial brick relief station... they use traditional floor timbers with plywood soles and no liners so any alteration is possible. 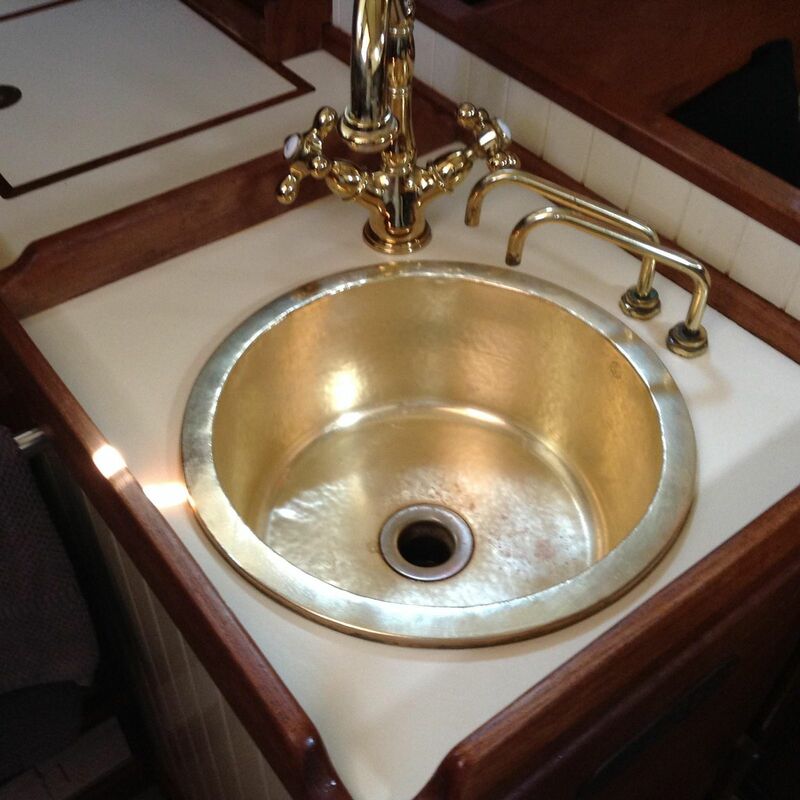 The bonding of the furniture to hull is very thorough -- and if you are contemplating the purchase of a complete boat, I can say that the quality of finish is of the best I have seen anywhere. If I sound like I am raving about all the wonderfulness of these boats, remember the title of this book. The chaff has fallen by the wayside long ago."